Examines the interactions and relations among new immigrants and residents in multiracial, multi-ethnic communities. Looks at interactions that may produce conflict, and the ways in which cooperation and accommodation could be encouraged. U.S. meat consumption has peaked. Data from the U.S. Department of Agriculture show that meat eating across the country fell from the 2004 high point of 184 pounds (83 kilograms) per person to 171 pounds in 2011. Early estimates for 2012 project a further reduction in American meat eating to 166 pounds, making for a 10 percent drop over the eight-year period. For a society that lives high on the food chain, this new trend could signal the end of meat's mealtime dominance. Virtual Worlds, immersive and collaborative environments on the Internet, also referred to as Web 3D, are likely to transform the global business environment. Developed out of online games, social networking, and Web services, Virtual Worlds benefit from several technologies that enhance their usefulness, including massively scaled games, avatars, cloud/on-demand/grid computing, on-demand storage, and next-generation networks. What this paper describes is how corporations in this century will begin to use new technologies to transform the methods of production, the generation of services, and the management of people and processes. 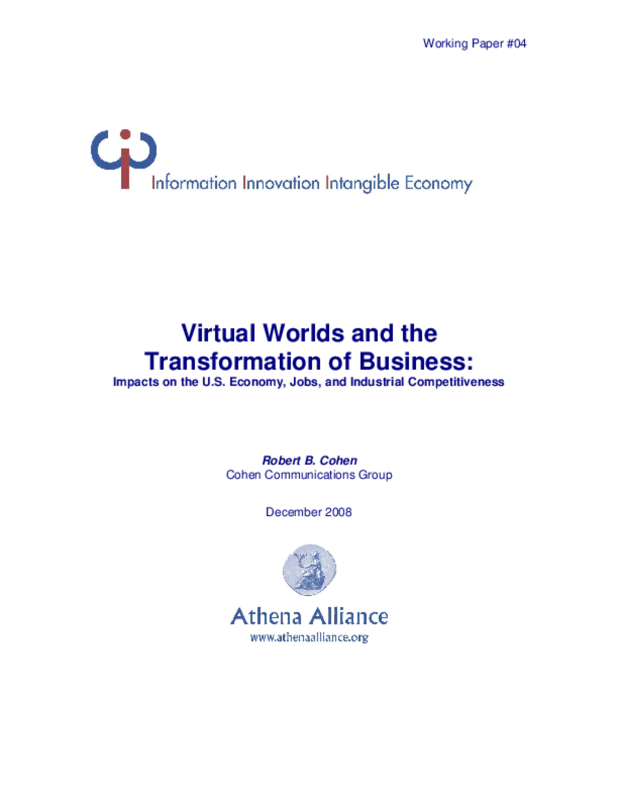 To make our case, this paper: Explains Virtual Worlds and how on-demand/utility/grid computing, on-demand storage, and next-generation networks support their commercialization.Explores how Virtual Worlds and the technologies that support them can change the nature of the firm and influence collaboration in business.Describes the changes that give rise to collaborative enterprise, including the two likely main forms of organization: the multi-industry conglomerate and the modern guild system. We also explore how enhanced collaboration has the power to extend and alter the ways in which today's firms create products and services and redefine relationships with suppliers and customers.Discusses how Virtual Worlds and supporting technologies will affect U.S. industrial competitiveness and provides policy recommendations in a number of areas, including deployment and adoption of Virtual Worlds, collaboration, skills development, and the ideal business environment needed for full and rapid adoption of these new technologies. 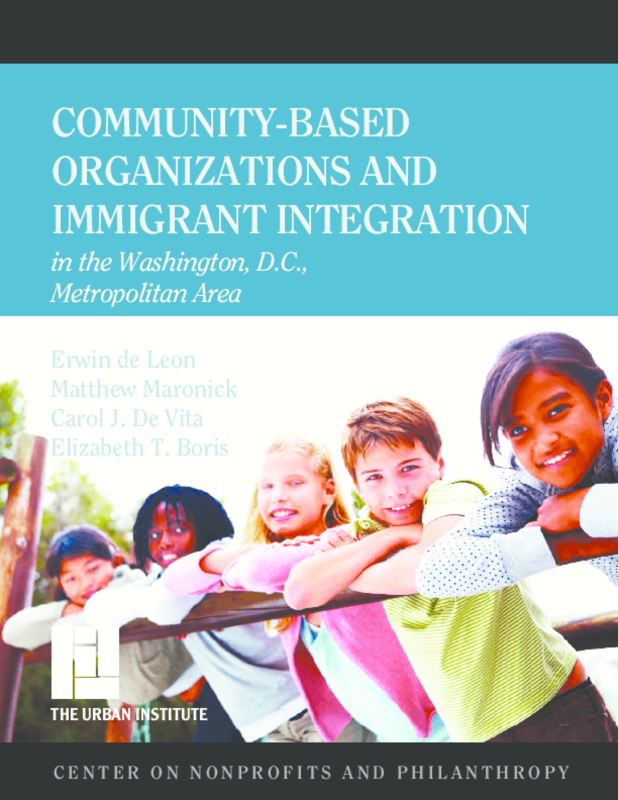 Examines the roles immigrant-serving nonprofits play in facilitating integration. Surveys programs and services, geographic and ethnic distribution, composition of personnel, sources of funding and support, impact of policy environments, and challenges. 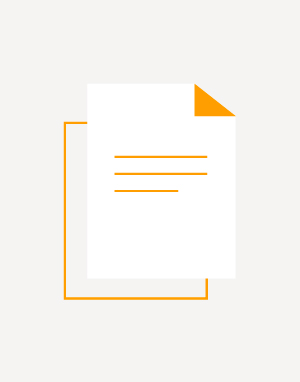 Contains president's letter, mission statement, program information, grant guidelines, grants list, highlights from Heron's mission-related investment portfolios, financial statements, and lists of board members and staff. Our national conversation about race tends to take place in black and white, yet the greatest disparities in human well-being to be found in the U.S. are between Asian Americans in New Jersey and Native Americans in South Dakota. An entire century of human progress separates the worst-off from the best-off groups within the U.S., according to the latest update of the American Human Development (HD) Index. What's new in this report? American HD Index scores for racial and ethnic group in each state, using the most recent government data to create a composite measure of progress on health, education, and income indicators. 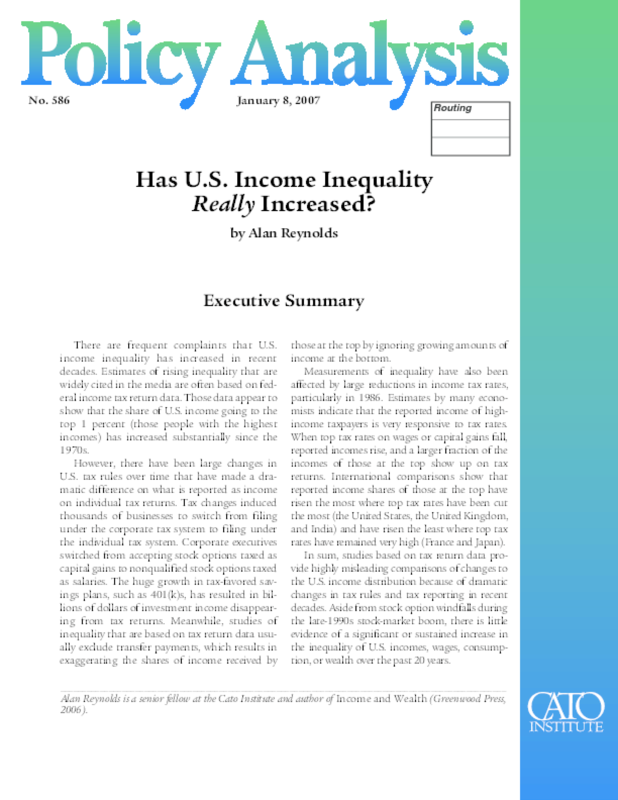 Previous reports have presented scores for racial and ethnic groups for the entire country and within specific states. This is the first time that American HD Index scores have been computed for racial and ethnic groups in each state. Rankings by state, for each major racial and ethnic group, on the American HD Index. The index reveals that the starkest disparities in well-being fall not between blacks and whites, but between Native Americans and Asian Americans. Asian Americans as a group top the rankings, with Asian Americans in New Jersey coming in at number one. If current trends continue, it will take Native Americans in South Dakota an entire century to catch up with where New Jersey Asian Americans are now in terms of life expectancy, educational enrollment and attainment, and median earnings. Analysis of what's driving the differences in human development outcomes for different groups. Disaggregated data on life expectancy, educational enrollment, educational degree attainment, and median personal earnings, all from the latest official government releases. Although the numbers tell a sobering tale, this data can be the start of a conversation about where in the country different groups of Americans are thriving -- and where others are falling behind -- and why. A holistic approach using official statistics paints a picture of today and helps us monitor change for a better tomorrow; as such, the American HD Index can serve as a tool for action. 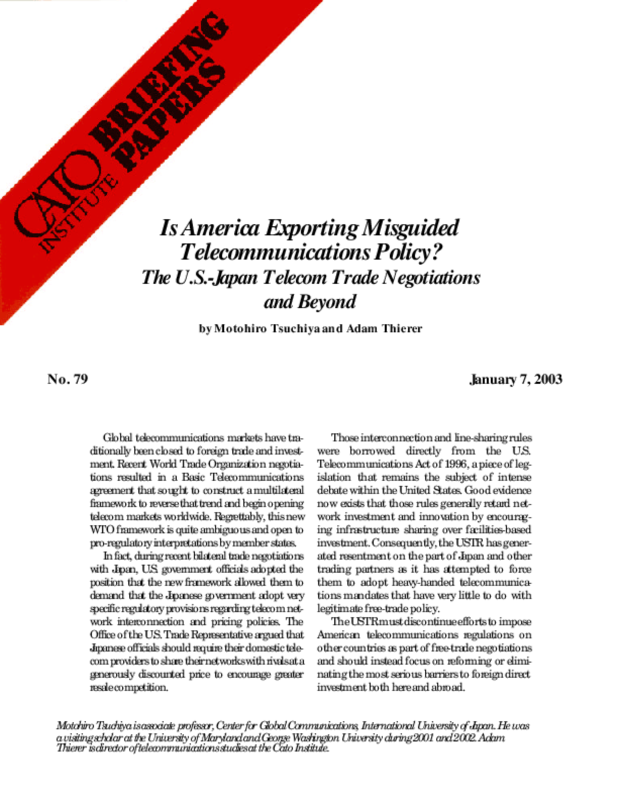 Global telecommunications markets have traditionally been closed to foreign trade and investment. Recent World Trade Organization negotiations resulted in a Basic Telecommunications agreement that sought to construct a multilateral framework to reverse that trend and begin opening telecom markets worldwide. Regrettably, this new WTO framework is quite ambiguous and open to pro-regulatory interpretations by member states. In fact, during recent bilateral trade negotiations with Japan, U.S. government officials adopted the position that the new framework allowed them to demand that the Japanese government adopt very specific regulatory provisions regarding telecom network interconnection and pricing policies. The Office of the U.S. Trade Representative argued that Japanese officials should require their domestic telecom providers to share their networks with rivals at a generously discounted price to encourage greater resale competition. 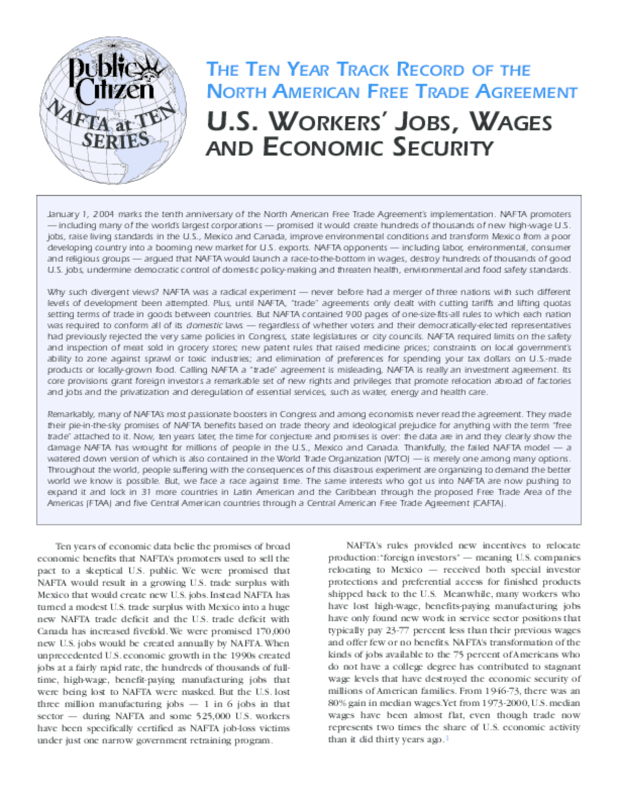 Those interconnection and line-sharing rules were borrowed directly from the U.S. Telecommunications Act of 1996, a piece of legislation that remains the subject of intense debate within the United States. Good evidence now exists that those rules generally retard net-work investment and innovation by encouraging infrastructure sharing over facilities-based investment. 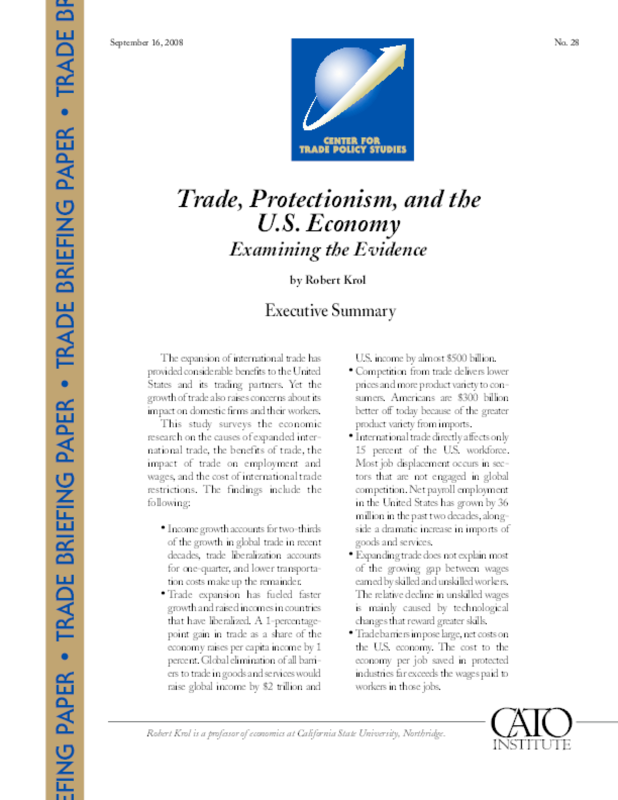 Consequently, the USTR has generated resentment on the part of Japan and other trading partners as it has attempted to force them to adopt heavy-handed telecommunications mandates that have very little to do with legitimate free-trade policy. 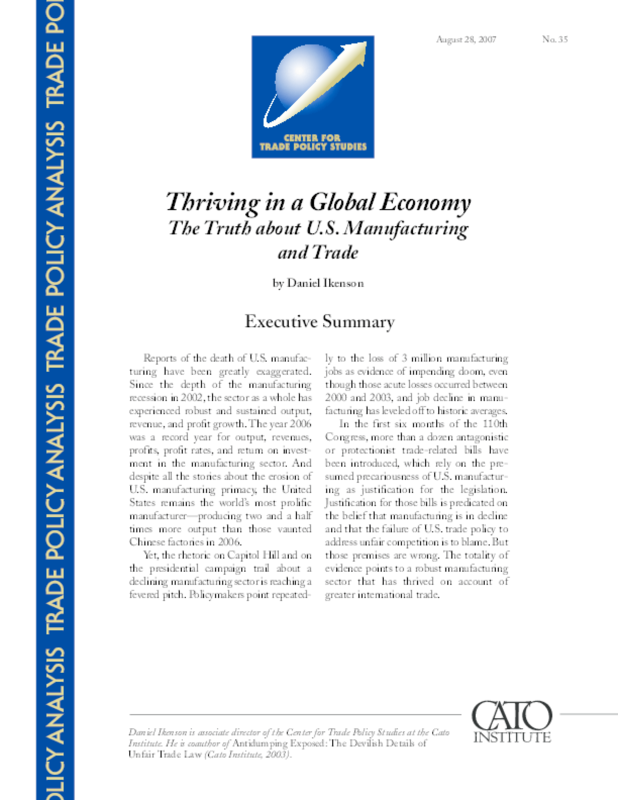 The USTR must discontinue efforts to impose American telecommunications regulations on other countries as part of free-trade negotiations and should instead focus on reforming or eliminating the most serious barriers to foreign direct investment both here and abroad. District of Columbia mayor Anthony Williams has convinced Major League Baseball to move the Montreal Expos to D.C. in exchange for the city's building a new ballpark. Williams has claimed that the new stadium will create thousands of jobs and spur economic development in a depressed area of the city. Williams also claims that this can be accomplished without tax dollars from D.C. residents. Yet the proposed plan to pay for the stadium relies on some kind of tax increase that will likely be felt by D.C. residents. Our conclusion, and that of nearly all academic economists studying this issue, is that professional sports generally have little, if any, positive effect on a city's economy. The net economic impact of professional sports in Washington, D.C., and the 36 other cities that hosted professional sports teams over nearly 30 years, was a reduction in real per capita income over the entire metropolitan area. A baseball team in D.C. might produce intangible benefits. Rooting for the team might provide satisfaction to many local baseball fans. That is hardly a reason for the city government to subsidize the team. 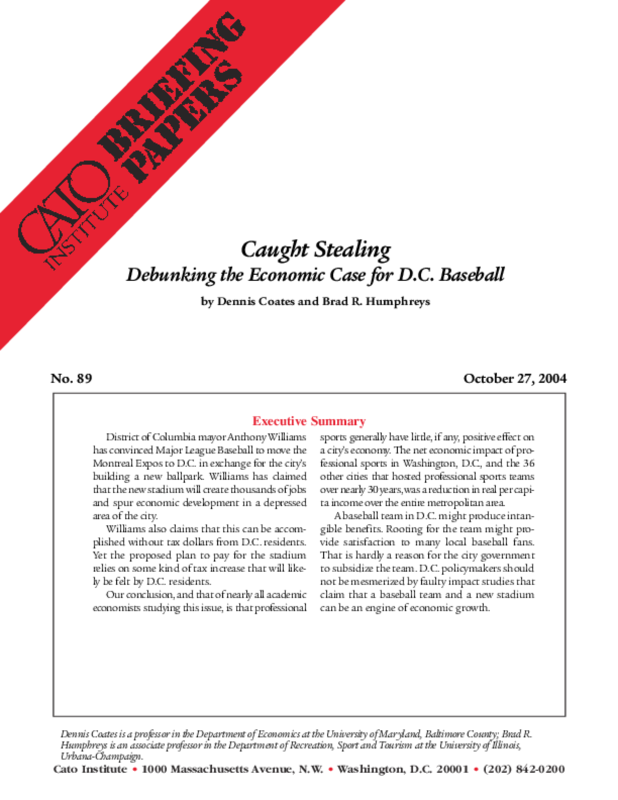 D.C. policymakers should not be mesmerized by faulty impact studies that claim that a baseball team and a new stadium can be an engine of economic growth.